I am now publishing once a week, on Monday. Toomey & Co. Auctioneers, Oak Park, IL, held an Art & Design sale yesterday, September 16, 2018. Included in the sale were a number of ceramic and glass lots by Newcomb College, Tiffany Studios, Gallé and Daum — the subject of today’s blog. Lot #214 was a Newcomb College chocolate set. It sold well, exceeding its high estimate of $12,000, realizing $16,250, including buyer’s premium. I’m quite fond of the work of Newcomb College, but I tend to buy only scenic vases, rather than floral items. It’s just personal taste and what sells best for me. I had no interest in this lot. 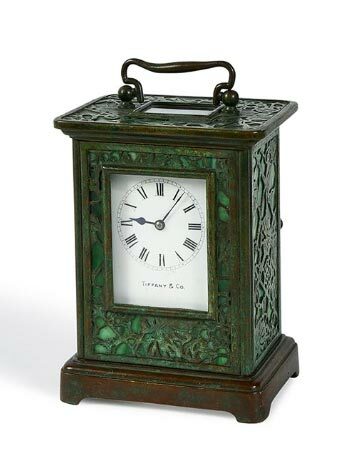 I tried to buy a very nice Tiffany Studios Grapevine carriage clock, but couldn’t because the price was too high for a clock with damage. Two glass panels were cracked and the door hinge was broken. It sold below it’s aggressive estimate of $4,000 – $6,000, realizing $3,250, including buyer’s premium. 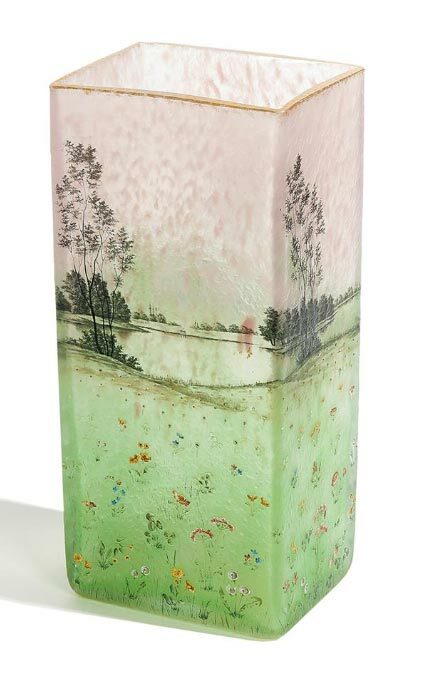 The best French cameo glass vase in the sale, a Daum Prairie vase did very well. It sold for $20,000, including buyer’s premium, against a pre-sale estimate of $5,000 – $7,000. Prairie vases are rare and very desirable, but this example didn’t have the best color and had some minor damage to one of the flowers, apparently from a slight impact somewhere in its history. I would have bid more strongly than I did if the condition were perfect. I was not the buyer. For the complete results of the sale, click here. No shows until Antiques + Modernism Winnetka (IL), November 1-4, 2018. We always look forward to our twice yearly exhibits in the greater Chicago area. But remember we’re still very much in business between shows, so please don’t hesitate to email or call. I recently listed some of the new items on my website and will list more every week. Click Philip Chasen Antiques to take a look. I will make every effort to actively list new items as often as time permits. I always strive to offer the finest objects for sale on my website and at every show. There are many items for sale, sold items with prices and free lessons about glass and lamps. And remember to keep reading my blog. My goal is to publish new posts twice a week — Mondays and Thursdays. However, if you don’t see a new post on Thursday, it’s because I was too busy, so please look for a new one the following Monday. I bid at five auctions this past weekend hoping to buy a few items at reasonable prices. I’m happy to report that prices were strong, so I bought almost nothing. Happy, because if prices are strong, the market is good, and I love a good market. One lot was #373 at Leland Little’s Fall Catalogue Auction in Hillsborough, NC, on Saturday, September 12, 2015. 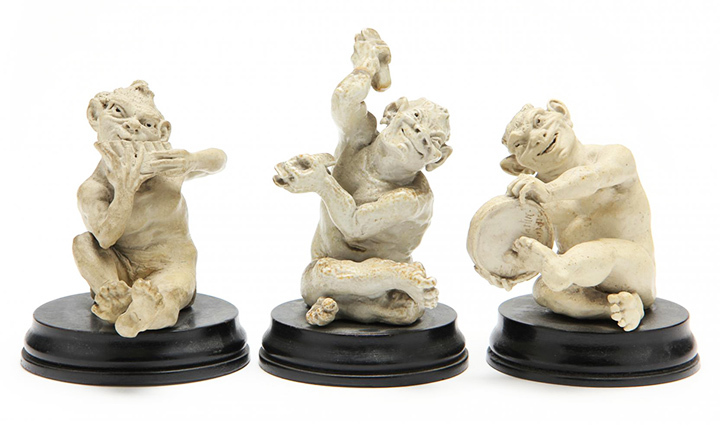 Three Martin Brothers stoneware musicians (two in perfect condition, one restored) were estimated to sell for $2,000 – $4,000, but sold well beyond my budget, for $8,850, including buyer’s premium. For the complete results of the sale, click here. The day before, I got a bigger surprise at Rago’s Great Estates auction, Friday, September 11, 2015. 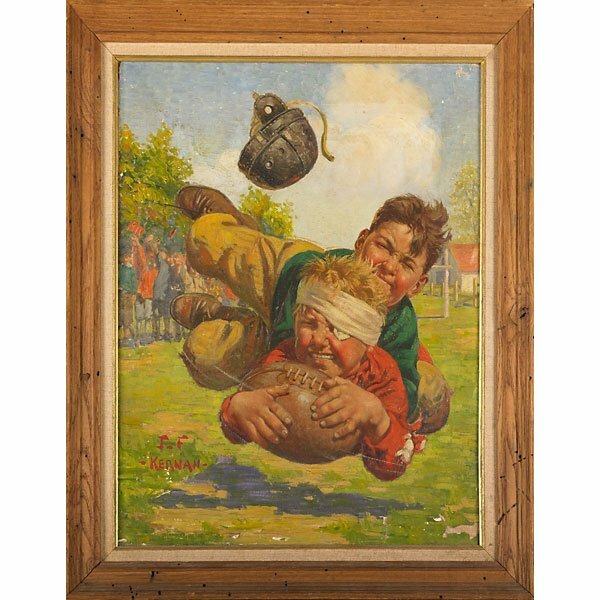 I noticed a couple of interesting American Illustration paintings in the manner of Norman Rockwell. Both were by Joseph Francis Kernan, an artist I didn’t know very well, but whose work I admired. Lot #2714 carried a pre-sale estimate of $1,500 – $2,000 and sold for $11,875 after serious competitive bidding from two phone bidders. The same two bid the next lot, #2715, to $17,500, against a pre-sale estimate of $3,000 – $5,000. I was hoping to buy them at or below the low estimates. Goes to show you what I know. Brunk Auctions may or may not have sold a lovely, large (10¾”) Newcomb College vase for $9,600, including buyer’s premium. I say may or may not because I really don’t know. The pre-sale estimate was $4,000 – $8,000. Auction houses never permit reserves higher than the low estimates, so once the bidding reaches the low estimate, an item is supposed to be sold. The hammer price reached $8,000, so it certainly appeared to have sold, but it’s listed on liveauctioneers as “Lot passed. No bid history.” I assume there’s a good explanation, but as of the publication of this blog post, I don’t know it. I wrote directly to Andrew Brunk, the owner of Brunk Auctions, and he responded that he didn’t know of the problem. It was his understanding that the vase sold at auction for $9,600. In the meantime, I’ll keep plugging away and get my fair share. Luckily I also have private sources for my goodies, so I hope to be outbid at every auction. 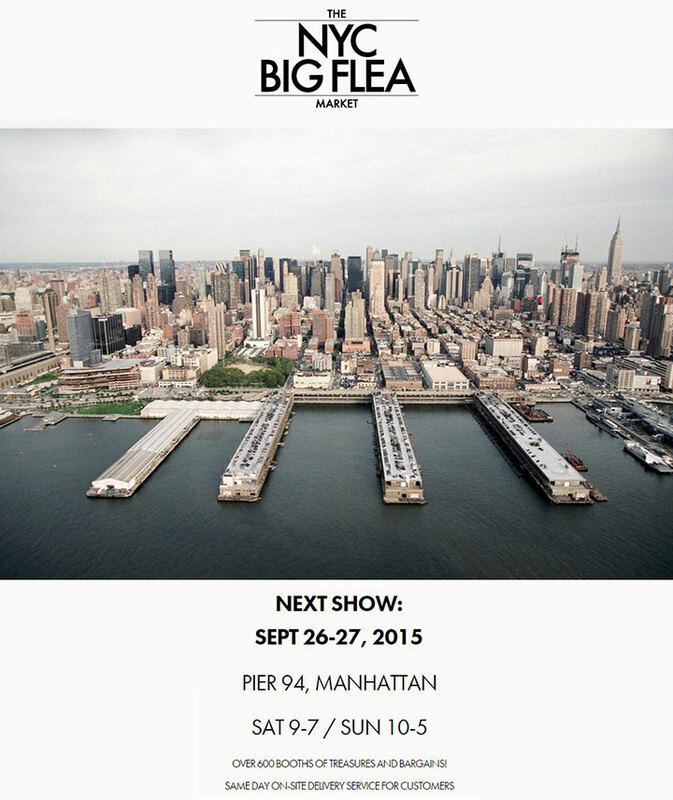 Our next show will be The Big Flea Market at Pier 94 in New York City, September 26-27. Last year was the first time for this show and it was good. The attendees were completely different than the established Pier Antique Show that takes place in November and March each year, making it a totally different experience. Click here to check my website for the latest items and to look around. I will update it as often as time permits. We’re still very much in business between shows, so please don’t hesitate to email or call. I always strive to offer the finest objects for sale on my website and at every show. There are many items for sale, sold items with prices and free lessons about glass and lamps. And remember to keep reading my blog. 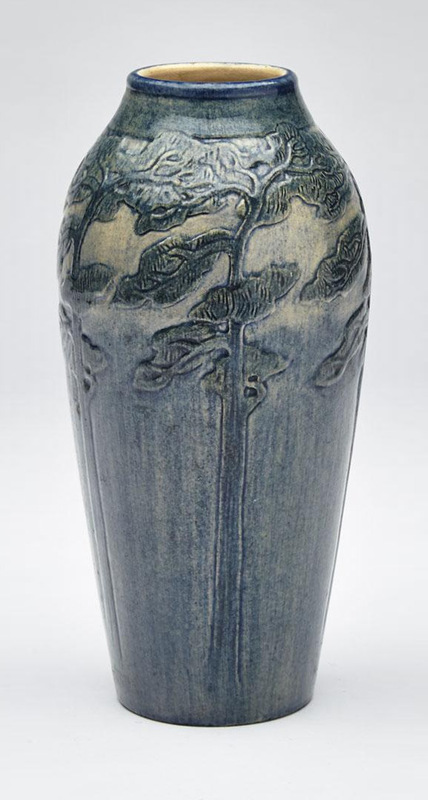 Waddington’s of Toronto, Canada, held a Decorative Arts auction on December 9, 2014. Included in the sale were two very nice Newcomb College scenic vases, estimated very reasonably. I had hoped to sneak up on them, since Newcomb College pottery seemed out of place in Toronto, but I was wrong. The vases sold very well so I was unable to buy them. First up was lot #126, a tall (11″), inverted trumpet, Newcomb College scenic vase, decorated by Anna Frances Simpson in 1912. It exceeded its high estimate of $3,500, realizing CAD 5,060, (USD 4,419). Lot #127 was an unusual scenic with tall pine trees, also by Anna Frances Simpson, 8½” tall. This was an earlier transitional example from 1909. (Early Newcomb vases were high glaze and later vases were matte glaze.) It was estimated to sell for $2,000—3,000, but more than doubled it’s high estimate to realize CAD 9,000, (USD 7,858) including buyer’s premium. For the complete catalog, click here. As of the writing of this blog post, the results have not yet been posted to their website. I’ll be spending the next month and a half looking for treasures to bring to Florida for our southern circuit. The Florida shows begin with the Miami National Antiques Show on January 24, 2015. Click here to check my website for the latest items and to look around. I always strive to offer the finest objects for sale on my website and at every show. 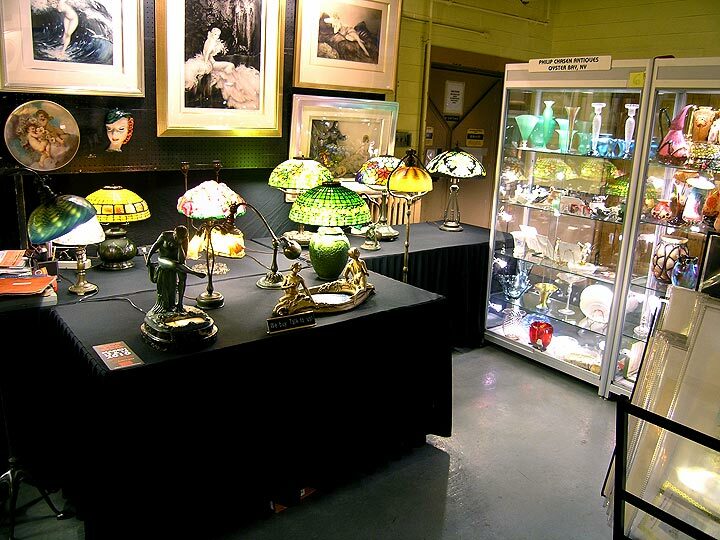 There are many items for sale, sold items with prices and free lessons about glass and lamps. And remember to keep reading my blog. 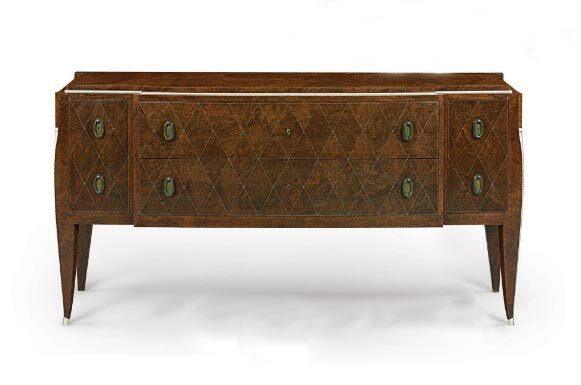 Rago Auctions held their Early 20th Century Decorative Arts Auction on October 18, 2014, with some good results, led by items from Newcomb College and Emile Gallé. Top lot of the sale was a tie between lot 99, a five-tile Newcomb College frieze and lot 286, a Gallé lamp. Each went out the door at $81,250. That price was below the low estimate of $75,000 for the Newcomb tiles, but above the high estimate of $60,000 for the Gallé lamp. 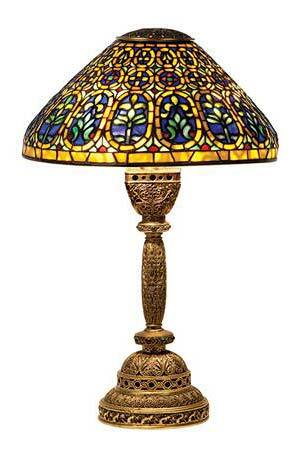 Several Tiffany Studios lamps were sold, mostly low-end. 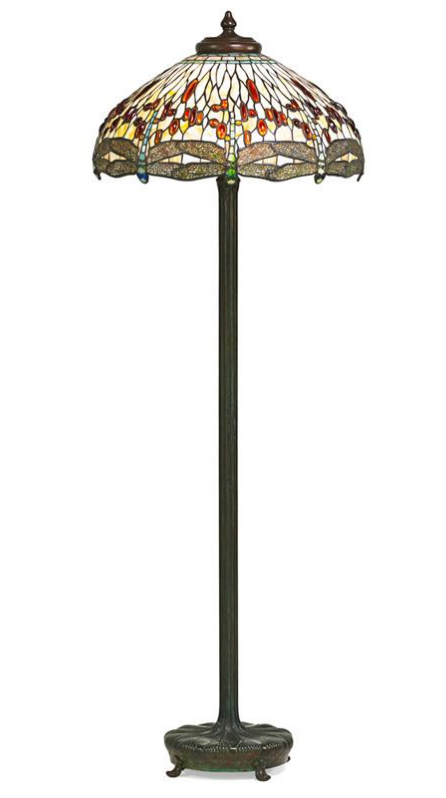 The exception was a Tiffany Studios 22″ Drop-Head Dragonfly floor lamp, consigned by the Los Angeles County Museum of Art. The color was only fair and there were a few minor condition issues, but the lamp still sold near the low estimate of $60,000, realizing $68,750, including buyer’s premium. 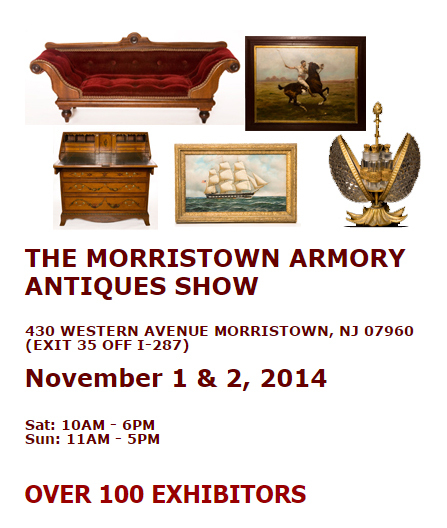 Our first show of four in a row will be held next weekend in New Jersey at the Morristown Armory, November 1-2. Then we travel to Chicago for the Antiques + Modernism Winnetka show, followed by the Kansas City Antiques Expo, ending up back at the Pier in NYC for the usual November show. Remember to check my website for the latest items and keep reading my blog. We’ll spend a lot of time finding some great new items for our November circuit. Click here to view our new website and look around. We always strive to offer the finest objects for sale on our website and at every show. 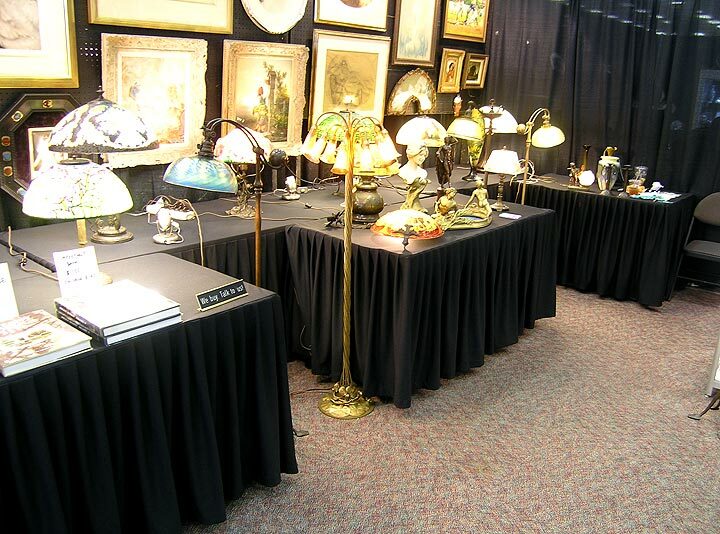 There are many items for sale, sold items with prices and free lessons about glass and lamps. What a difference a show makes. Two weeks later, in basically the same city, Los Angeles (Redondo Beach vs. Pasadena), the tenor of the show completely changed. Attendance wasn’t significantly improved from Redondo Beach, but the show looked and felt different. There was lots of interest in different categories of items and selling was more broad-based. I can call this show a good one, not a lucky one (read my previous blogs for a more complete explanation.) Gross sales were lower, but selling more items to more people felt better. Interest was good in French glass including R. Lalique, Pairpoint and Tiffany lamps, and pottery, including Newcomb College. Many collectors were asking intelligent questions about a whole host of collecting categories. It felt like a normal show in normal times. Now I’m more upbeat about the upcoming shows in Chicago and Baltimore. I believe business is a bit tougher in California than it is in the rest of the United States, but I’ll be able to give a more definitive answer in a few weeks. I especially want to thank my loyal clients, who buy from me repeatedly. I recently added over 10 Galle vases to my website, 7 Tiffany lamps, 1 Grueby vase, 1 Newcomb vase, Daum Nancy glass and a fabulous Burgun & Schverer internally decorated vase. This coming week, I’ll be adding many new items. Please take a look. Click on this link chasenantiques.com. Please send me your comments or questions about art glass, lamps, Louis Icart, shows, auctions, etc. If it’s interesting, I’ll answer you in a future blog. 2:20 PM Sunday. Although attendance has been decent throughout the show, sales have been poor (read non-existent) since Friday afternoon. So based on the results to this minute, we will not be returning to exhibit in Denver. Should something dramatic happen in the last few hours of the show, I will be pleased to change my mind. It’s too bad that the locals don’t buy enough to support the show. Denver is a nice city and Colorado is a beautiful state, but business is business. 5:00 PM, Sunday. The show just closed and sales for the day were $30. Two out of the three shows in Denver were not good, so we have decided not to return to Denver. I spoke to several dealers and each and every one told me the show didn’t go well. That’s how shows fail. A vicious cycle begins when the dealers can’t sell enough to warrant returning. The show gets smaller, the public is disappointed, and round and round it goes until the show fails. Cleveland used to be a wonderful city to exhibit many years ago, especially at the Cleveland Coliseum, halfway between Cleveland and Akron. Now all of the shows there have failed and there is no decent antique show in the area. Now we’re on to the Redondo Beach Antiques Show, just south of Los Angeles, this coming weekend, July 23-25, 2010. That show has been shrinking every year, but business is usually decent. I’ve met some of my best clients there, so I hope it doesn’t fail. Apparently that isn’t the case for the other dealers, as many have dropped out. The antiques show business has become tough, with only the best shows surviving in major cities like Miami, New York, Chicago and Baltimore. I’m bringing some amazing items to the Redondo Beach show, including a Tiffany 12-light lily floor lamp. 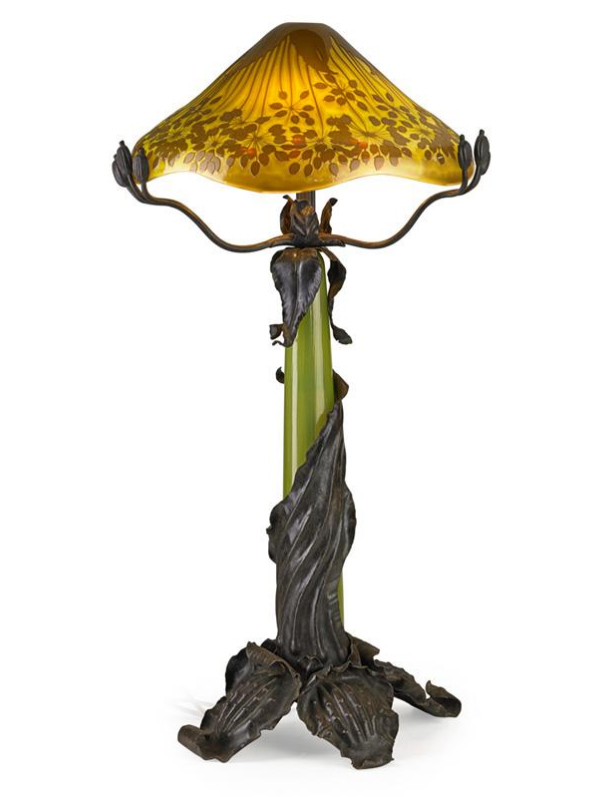 Tiffany lily lamps are not rare, but lily floor lamps are. It’s only the second one that I’ve had for sale in the last 35 years. I’ve got another six Tiffany floor lamps, as well as a superb collection of table lamps that I’ve recently acquired. In addition, I’m bringing a wonderful selection of Tiffany, Galle and Daum Nancy glass, and American art pottery, including some great examples of Grueby, Newcomb College, Marblehead, and George Ohr. Please come and visit me at the Redondo Beach Antiques Show and introduce yourself. June is 20th Century Decorative Arts Month, or so I’ve named it. Every June (and December), it seems every major (and minor) auction house has a 20th Century Decorative Arts sale. The June sales usually don’t have as powerful a selection as the December sales, but it’s still quite good. The June sale at Sotheby’s was strong, as I reported in my last blog entry. The overall results of the Christie’s sale the following day were good, with total sales of $5,853,100, but the Tiffany lamp sales were weaker, except for the best examples. Sotheby’s selection of Tiffany lamps was more select than Christie’s and the results showed. This time around, collectors were looking for superior examples and those excelled. Bargains were to be had for some of the less expensive lamps. For the most part, under $50,000 lamps suffered, while the over $100,000 lamps did well. The top lot of Christie’s sale was #97, an Emile-Jacques Ruhlmann burl walnut and ivory commode, circa 1925. Estimated to sell for $150,000-200,000, it quadrupled the low estimate to sell for $614,500, including buyer’s premium. 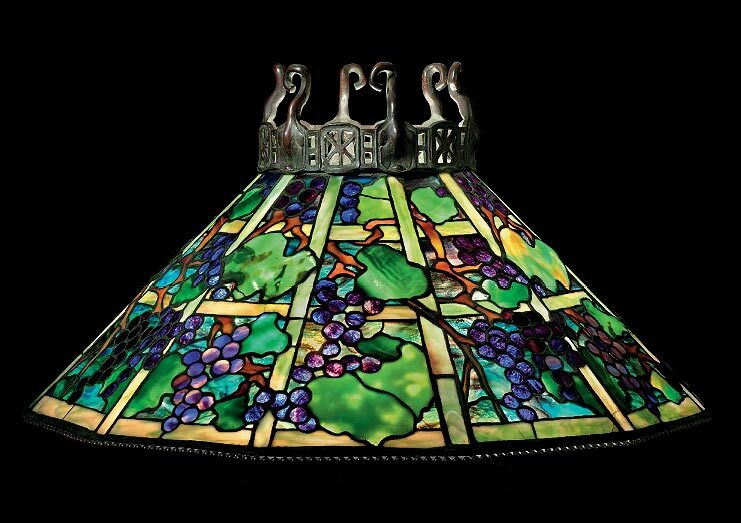 A beautiful Tiffany Studios Grape chandelier, lot #45, was the second highest lot of the sale. It more than doubled the low estimate, selling for $398,500, against an estimate of $150,000-200,000. It continued the trend of strong results for the best examples. At the other end of the spectrum, there were bargains to be had. 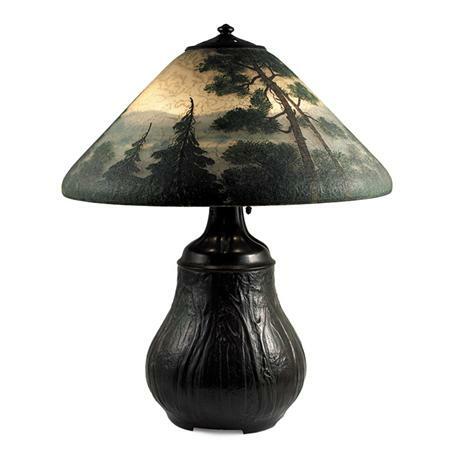 Lot #29 was a 16″ diameter Tiffany Studios Linenfold table lamp. It was estimated very conservatively at $8-12,000 and sold for $9,375, including buyer’s premium, slightly below the low estimate. 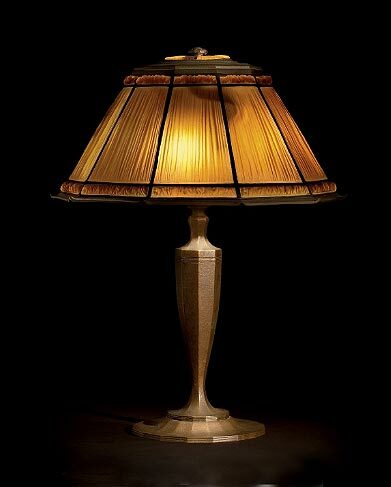 At retail, the lamp is estimated to sell for $15-20,000. For the complete results of the sale, click on the following link. Christie’s 20th Century results. I just added over 10 Galle vases to my website, 7 Tiffany lamps, 1 Grueby vase, 1 Newcomb vase, Daum Nancy glass and a fabulous Burgun & Schverer internally decorated vase. I’m spending a lot of time this spring adding new items. Please take a look. Click on this link chasenantiques.com. Doyle New York holds a Belle Epoque auction twice yearly. 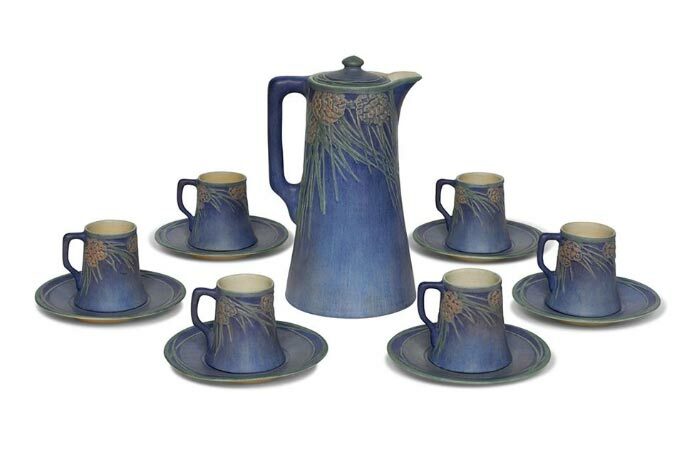 It’s a diverse sale of objects from 19th Century Victorian to Art Nouveau, Art Deco and some modern. The winter sale was held on February 24, 2010 with generally excellent results. I asked the expert in charge, Malcolm MacNeil for his impressions of the the sale. Here is his reply. Other items which performed well were a Handel obverse and reverse-painted scenic table lamp, estimated for $3-5,000 that sold for $10,625, including buyer’s premium, several good Quezal shades that descended in the family of Edward Conlan, the secretary of the Quezal Art Glass and Decorating Co., and a green Tiffany Studios millifiori decorated vase, estimated at $2,500-3,500, that sold for $9,375, including buyer’s premium. Here is the link for the results for the entire sale. Doyle Belle Epoque results. I’m taking a lot of time to add new items to my website. 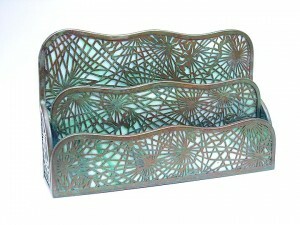 I’ve already listed new items under Gallé glass (including a blownout vase), Daum Nancy glass and Tiffany Studios glass. Soon I’ll be adding pottery by Newcomb College, Marblehead and Rookwood. Please take a look, as every day I’m adding more. Click on this link chasenantiques.com. Please send me your suggestions or questions about art glass, lamps, Louis Icart, shows, auctions, etc. If it’s interesting, I’ll answer your question in a future blog entry. The Northeast has been hammered with several major snowstorms this winter, with the latest one starting last Thursday. The rain/snow line was I-95 in New Jersey, with snow to the west. Unfortunately Morristown, NJ is west of the line, so the show started out with one strike against it. Many people called the show management to see if the show was canceled, but conditions improved rapidly, so there was no problem. The show opened on time, but attendance on Saturday was a little slower than normal. Sunday attendance returned to normal. Sales on Saturday were lackluster with interest in Tiffany desk pieces and Fulper pottery. Sales on Sunday were dismal, but interest was strong in a couple of important items that may sell after the show. I still haven’t made up my mind as to whether I’ll return to exhibit in Morristown. I’ll wait to see if any sales develop after the show. Right now, it’s probable that I won’t be back. It’s not enough for people to admire my display. 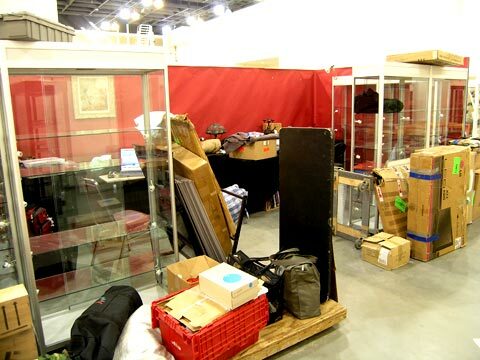 The local people have to support the show by purchasing from the exhibitors or the exhibitors won’t be back. 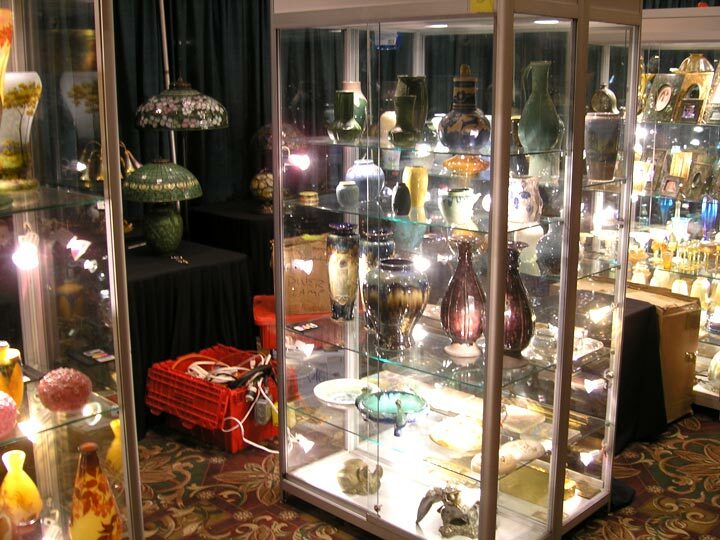 For several years, I’ve heard lots of good things about the Grove Park Inn Antiques Show, though I’ve never had the opportunity to visit nor exhibit there. I decided this was the year to try, and so far it’s looking like a very good decision. The show hasn’t even opened yet, but it’s very pleasant so far, with a good vibe. First is the Grove Park Inn itself. It’s a wonderful 1913 masterpiece of a hotel. Just being in the lobby with the gigantic boulder fireplaces surrounded by people warming themselves in rocking chairs is great fun. 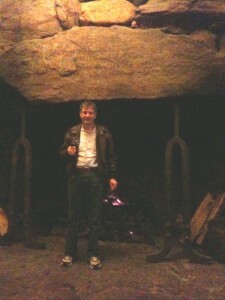 Add to that a glass of delicious Ravenswood Zinfandel Lodi 2007 and you’ve got a wonderful relaxing time. And of course, enjoying it with my honey makes it perfect. The show promoter, Bruce Johnson, is very friendly. He made us feel welcome, as well as most of the other dealers, many of whom I already know. Setup went very well, except that North Carolina is having a cold wave. It was colder here than in New York. For most of the day, the roll up door was open and we had to set up in freezing conditions. What a relief when they finally closed the door and the room warmed up. 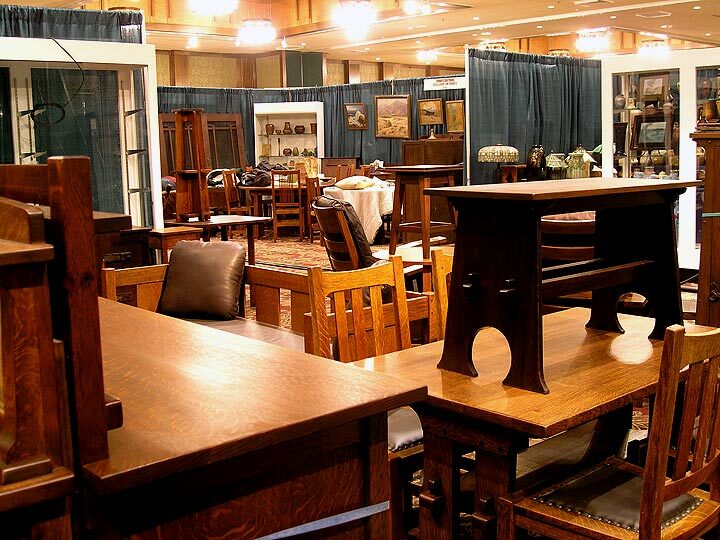 It’s a beautiful show with very high quality Arts & Crafts furniture, ceramics, and linens. The show is mixed, with the antiques dealers in the main ballroom and the quality reproduction dealers in the hallways. There are many lectures for attendees, so the whole weekend is a complete Arts & Crafts experience. From everything I can see, it’s Arts & Crafts heaven. I’m not a perfect fit for this show, as many of my items are Art Nouveau, but I have enough Arts & Crafts items to satisfy many collectors. 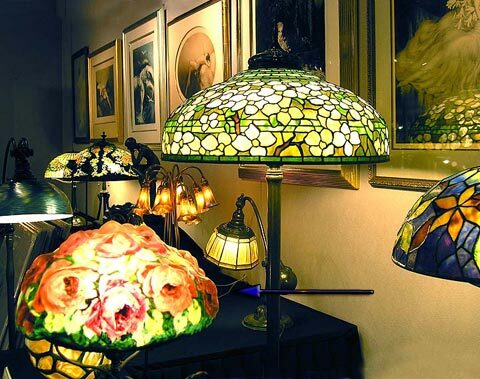 I’ve brought many Tiffany lamps and they’re perfect for Arts & Crafts homes. I also have a nice collection of Arts & Crafts ceramics, including Rookwood, Newcomb College, Grueby, Arequipa, Marblehead, and others. Right now, I’ve got a good feeling that the show will go well. Read my post on Monday and I’ll let you know. I’m taking a lot of time to add new items to my website. I’ve already listed new items under Gallé glass (including a blownout vase), Daum Nancy glass and Tiffany Studios glass. Soon I’ll be adding many Tiffany Studios desk pieces. Please take a look, as every day I’m adding more. Click on this link chasenantiques.com.